Our commitment to academic freedom means that we do not support so-called 'trigger warnings,'... and we do not condone the creation of intellectual 'safe spaces' where individuals can retreat from ideas and perspectives at odds with their own. What is a trigger warning? The term, often used interchangeably with "content warning," is a heads up that readers may encounter distressing content--and in recent years, trigger or content warnings have become controversial. To some, like University of Chicago administrators, such warnings keep students from being challenged or engaging with provocative course materials. Others feel that such warnings are useful tools that keep learners from having a strong emotional response to certain kinds of content, usually depicting physical or emotional violence. For all of the excitement around trigger warnings, they're actually quite rare. In an effort to gather more information about their use on college campuses, the National Coalition Against Censorship conducted a survey of over 800 educators from the Modern Language Association and the College Art Association--and found that only one percent reported that their institutions had adopted a policy on trigger warnings. Moreover, only fifteen percent of respondents said that students had asked for warnings. In many respects, framing content warnings as a "censorship" or "free speech" issue is not helpful to professors or students. There is no evidence that they lead to the widespread suppression of troubling material or class discussion. At worst, warnings are merely gratuitous for a majority of students. At their best, however, content warnings can actually help students engage with course material and develop a caring relationship with their teachers. Although the terms "content warning" and "trigger warning" are often conflated, they aren't the same thing. A "content warning," much like a PG-13 or R movie rating--or a NSFW at the start of an email that, well, you really shouldn't open at work--warns the consumer of the material to prepare for potentially graphic content ahead. It's an alert to students that they may encounter something mature or challenging, so that they're not surprised when that content appears. 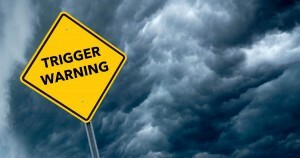 A "trigger warning," on the other hand, refers specifically to psychological triggers that might cause an extreme and unconscious reaction for people who have experienced trauma, like physical or sexual assault, combat, or natural disasters. About three-fourths of us will experience trauma over the course of our lifetime. About ten percent of those people will develop post-traumatic stress disorder (PTSD), experiencing symptoms like flashbacks, memory gaps, depression, or hyper-vigilance. Avoiding triggering topics--a very common strategy for people with PTSD--isn't the best way to process traumatic events. Avoidance of triggers is a symptom of PTSD, not a cure. In fact, exposure therapy (a specific type of cognitive behavioral therapy where patients are exposed to physical or mental reminders of their trauma) is not only most common method for treating PTSD; it's also one of the most effective. This research might lead some to suggest that perhaps we don't need to be so concerned about student's exposure to triggering content, if exposure is the best way for them to process past traumatic events. However, exposure therapy works best under the care of a trained therapist. Even though exposure is an effective way to deal with PTSD, instructors aren't therapists and the classroom is not an appropriate place for such a therapy. Trigger warnings are also challenging to implement, because identifying potential triggers isn't easy. Individuals with past trauma are often triggered by seemingly neutral things that have nothing to do with the content an instructor might present in class--the scent of a certain type of cologne or hearing a song associated with the traumatic event they experienced. Educators won't always know what might trigger a student who is a victim of trauma and can't possibly provide a warning for everything that might be a trigger. Dani Behonick, a health science professor at Cañada College, acknowledges the difficulty in determining which material might trigger students. "No matter how mindful I am about stuff that's likely to trigger my students," she says, "I can never know the extent of what they have going on, so I must be prepared for them to be triggered by something I never saw coming and be ready to hear and support them when it happens." While Behonick may "sometimes precede content by acknowledging, in some way, that folks may find it challenging," she doesn't use formal trigger warnings in her courses, which cover issues like abortion, cancer, and food insecurity. Instead, Behonick focuses on her relationships with students so she can support them if they are negatively affected by subject matter. "This is why I consider it so important to try to establish a relationship with each student that at least allows them to feel safe talking to me one-on-one before anything comes up," she says. "That, to me, is just as, or even more, important than trigger warnings." So, if trigger warnings aren't all that effective, and they're also hard to implement, is it worth using warnings at all? Ideally, content warnings aren't meant to serve as a "get-out-of-this-assignment-free" card or an excuse to not engage with course material (as the University of Chicago letter implies); their purpose serves to give the reader the opportunity to mentally and emotionally prepare for consuming the content. Students are entering higher education with varied backgrounds, including those from low-income or minority backgrounds, or having served in the military. At least some of the students will have experienced trauma. Providing content warnings may show care and concern for the emotions of your students, enhancing the teacher-student relationship--and they may serve as an alert that they're about to encounter material that demands special attention, and possibly preparation. In this way, content warnings can help students to fully engage with the content. So how can educators warn students about potentially troubling content without stifling discussion or discouraging participation? Here are some tips. 1. Be upfront about what students can expect from your course. Namwali Serpell, an English professor at the University of California, Berkeley, offers one content warning on the class syllabus: "Please be advised that all readings and screenings in the course are required; some texts include graphic violence and sexually explicit subject matter." If you cover specific topics that you anticipate could elicit a strong emotional response, you may want to provide a similar warning about the emotions students might experience, so they can be prepared. As part of setting expectations, you can let them know that they can come to you with any questions or concerns, opening the door for a caring relationship. 2. Consider alternative readings or activities. Obviously, there are times when an alternate exercise won't do. When teaching about World War II, students will have to read and engage in conversations about war. But if your point can be made using a different reading that doesn't contain the same graphic content, it would make sense to do so--or at least provide a range of optional reading. You may also consider extending flexibility in terms of where class assignments are completed. Can students watch a graphic video in another setting--perhaps their own home, or with a trusted friend--instead of in the classroom? 3. Offer information on other coping strategies and self-care. Most professors are not trained therapists and shouldn't be expected to play that role. However, educators can still provide information on self-care and coping strategies. A note to remind you to take care of yourself. Do your best to maintain a healthy lifestyle this semester by eating well, exercising, avoiding drugs and alcohol, getting enough sleep and taking some time to relax. This will help you achieve your goals and cope with stress. All of us benefit from support during times of struggle. You are not alone. Beyond this, you could also invite students to come up with their own list of self-care strategies at the start of the semester. Refer back to these lists throughout the semester so students remember to turn to them in times of stress. And of course, make sure to share the information for the campus mental health center, for students who may need more serious help. Providing students with reasonable accommodations is an expected part of teaching. We provide accommodations for students with physical and learning needs--why not emotional? We can't cover all of the content that might surprise--or trigger--our students, but we can cover some--at no cost to educators and a potential benefit to students.